This is my second favorite Ealing comedy, behind Kind Hearts and Coronets. If ever there was a film that defined Ealing comedy, it's this one. A bit of whimsy, a little slapstick and a lot of highbrow humor make this a definite must see for anyone who loves good comedy. Oh, and by the way Jon, nice catch on the image. I was just about to scold you for it. I didn't have to catch the image, so there! I knew it would be wrong; it was just a matter of remembering which number I gave it. OK, I'm saying your favorite is Whiskey Galore. Am I right? Nope. It's years since I saw that. I must look it up though. When reviewing The Man In The White suit, I suggested that Alexander MacKendrick had a screenplay so clever it smartly demonstrated the rules of traditional narrative. The wonderful and devilish plot of The Ladykillers (by William Rose and Jimmy O’Connor), four years later, goes further still, by being a perfect execution of the same rules and yet is far more entertaining and watchable. Add MacKendricks consummate grasp of genre and the ease with which The Ladykillers unfolds is so brilliant it is almost rude. This is one of the finest British films ever made and the irony is MacKendrick and Rose were Americans. Well, MacKendrick had lived most of his life in Britain, but still, maybe their viewpoint was essential, because The Ladykillers is as English as can be, especially in character. Each one is a clear individual, yet they gel together beautifully. Location is also important, with the lonely house seemingly isolated from the town in almost a Western fashion, especially considering the railway that is so essential to the final act. The blackly comic story, with tinges of horror at odds with the comedy, is about a criminal mastermind, executing the perfect crime, yet failing to account for a frail, elderly landlady who nevertheless will be a formidable, if naive, nemesis. The film introduces Mrs. Wilberforce as an eccentric, amusingly tolerated by the local police (headed by Jack Warner, who else?) as she comes in with all sorts of tall tales about potential crimes. Obviously a regular, you can probably guess how it will end up, but being a little predictable actually helps a film like this, because the central idea is so daft! The gang of crooks are great fun. Peter Sellers and Herbert Lom are especially so, with able support from Cecil Parker and Danny Green as faithful, dumb, but succinctly named One Round. Leading this motley crew is Alec Guinness as Professor Marcus. It is an astonishing performance and ranks amongst his very best, simply because it is such a complete makeover, yet he engages with the viewer (unlike White Suit) and doesn’t steal the film from anyone. Actually in a nice reflection of the story, he absolutely fails to take anything away from Katie Johnson as the eponymous Mrs. Wilberforce. What a wonderful character! Sums up the Great British little old lady, utterly dotty yet with such elegance (apart from when she deals with her pipes! ), as she quietly and quite unknowingly, unravels the successful heist away from the helpless gang, who all come to realise they are utterly powerless to deal with her. It’s a fantastic conceit that gives us some laugh out loud moments. While all the dialogue is as witty and sharp as you’d expect from an Ealing production, Katie’s lines are especially funny (catch the reference to the taxi driver refusing a fare!). Much as I enjoy the Coen brothers’ work, their remake can be considered an absolute failure just based on their versions of these characters. Marcus should have known though. He is introduced with a passing nod to Hitchcock’s The Lodger (“I understand, you have rrrooms to let”) yet his looming, scary presence is lost on Mrs. Wilberforce and he immediately becomes bothered by her little house that’s as wonky as its owner! Professor Marcus is all about regimented order and his plan to disguise the gang to his landlady as a group of musicians is no accident. Everything he does has a rhythm (Guinness can even be caught almost dancing while performing) and the film follows his beat, apart from Mrs. Wilberforce of course, who is responsible for at least two hilariously farcical set pieces, one involving Frankie Howard! While great use is made of Boccherini’s Minuet –Marcus even hums it when timing the heist- it should not detract from the inventive score that keeps up with the continual changes in mood and genre. The regimented rhythm allows a light touch and immense scope from the director. It’s a delightful film that should be essential for anyone interested in how films are structured or just simply want a bloody good laugh. For some reason, I thought you had already reviewed this film. Definitely not! Bit of a struggle that one. I watched it multiple times for Film Studies and still have the essays deconstructing genre and narrative. That actually makes doing a regular review a pain in the arse! It is possible to know a film too well. Still, it only goes to prove how brilliant it is that I still adore it as much as when I first saw it many years ago. Watched this today and agree with everything that was said in the review! An awesome film, perfect Sunday afternoon entertainment which moves along at a breakneck pace! Good stuff! Glad you enjoyed it. This deserves much more recognition. Just finished watching Kind Hearts and Coronets again, Joan Greenwood...meeeeoooowwww!!!! Having my own little Ealing marathon today. Just finished Whisky Galore! 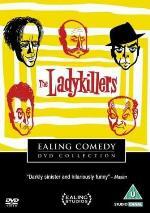 Think I'm going to watch The Ladykillers tonight. Well, I just finished watching Hue and Cry, and I think I'm going to have to give it a second try, because it didn't quite resonate with me. I think this is due to the fact that I went into it with a pre-conceived notion about the direction the storyline was going to move in. When it didn't pan out this way, it kind of threw me off my mark. While I thought it was a cute film, I expected a little more from it. I've seen it several times now and I just love it. Remember though that I stressed I saw it as a children's film, a Boy's Own adventure. Comic book simplicity, but it still a story that treats its viewer as intelligent. I love it where they're trying to threaten the lady after tying her up!